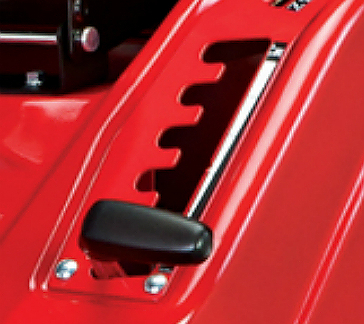 The picture above shows is the height-of-cut lever on a Snapper rear engine ride-on mower. 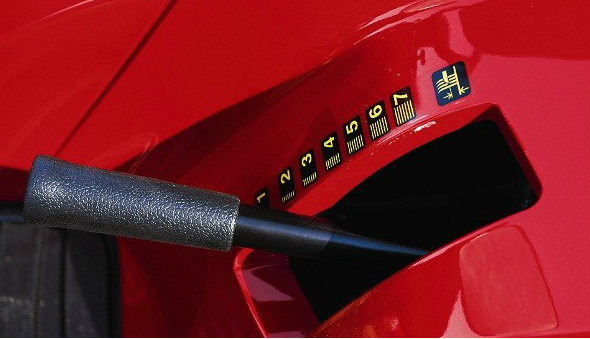 It sits to the left of the operator in very easy reach and lifts with very little effort. Like walk-behind mowers, there will be a range of cutting heights and with ride-on mowers and tractors that ranges vary from 30-80mm on small ride-on mowers up to the large heavy duty machines like Westwood tractors with their 10 stage heights from 12-101mm. The controls are generally designed ergonomically so they are very comfortable to hold, to reach and to use with reduced hand or arm strain. Here are another couple of examples. 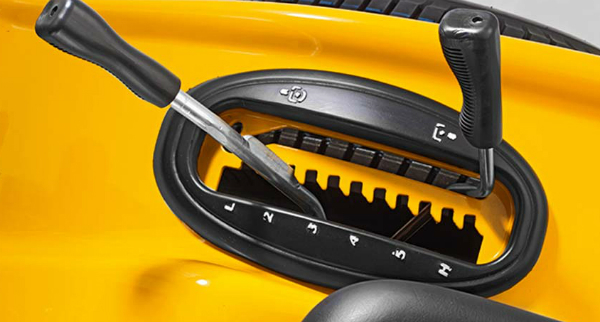 The first from a Cub-Cadet front-cut ride-on mower with 6 stages, as you can see at the bottom of the picture. and here is one from a Mountfield lawn tractor. Note the comfort grip handle and the clear numbering and labelling of the 8 stages.